The Clerk and Recorder’s Office is committed to our customers, our community and our country. We provide professional, efficient service while ensuring our processes are legally compliant. The expertise and skill of our staff is evident by the recognition our office has received. The awards below are indicative of the confidence the public has in the office of the El Paso County Clerk and Recorder. 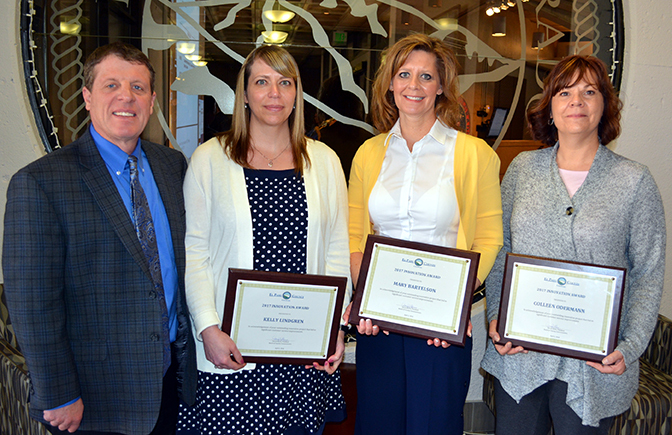 In recognition of the exemplary leadership of Kelly Lindgren, Motor Vehicle Manager, Mary Bartelson, Chief Deputy/Operations Manager, and Colleen Odermann, Accounting Supervisor (pictured with Clerk and Recorder Chuck Broerman) in developing and implementing the Colorado MVExpress Kiosk program. Through their expertise and collaborative coordination with County departments and the vendor ITI the Clerk’s office successfully opened vehicle registration renewal kiosks at four motor vehicle branches. The kiosk program continues the Clerk’s innovative approach to offering enhanced services and professional customer service. Our Elections Department partnered with The Independence Center (TIC) in 2016 and 2017 to identify specific challenges to voting accessibility for voters with disabilities. Among improvements to accessibility were TIC training election judges in disability etiquette, open houses to demonstrate how to use election equipment, ASL interpreters available to assist voters, and the Clerk’s Office production of its first ASL-interpreted sample ballot for the 2017 Coordinated Election. In recognition of the partnership between our Office and The Independence Center to guarantee voting accessibility for all citizens in the County. 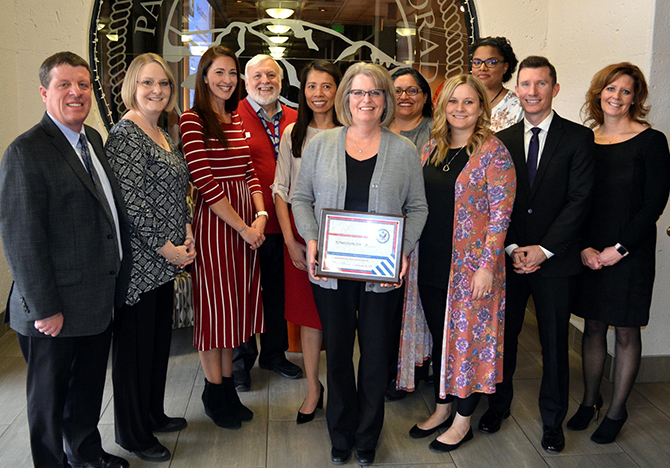 The award is for innovative work in voting accessibility, and in 2016, The Independence Center was set up as the first highly accessible Voter Service & Polling Center in El Paso County. 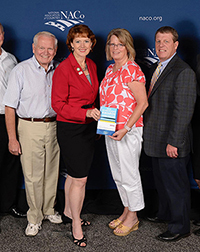 The Elections Department had received a 2015 Innovation Award for the same innovative program (see below). Both the NACo and County Awards reaffirm our office’s commitment to ensuring citizens’ democratic right to vote is unencumbered and further imbues voters with confidence in the election process. In recognition of enhancements to election processes developed by the Election Department staff members for the 2015 Coordinated Election. The result saved taxpayers $189,000 and improved the voter’s experience. The impact will reverberate in elections for years to come. The Innovation Award distinction is a testament to our staff’s professionalism, knowledge and dedication in conducting fair, transparent, accurate elections. 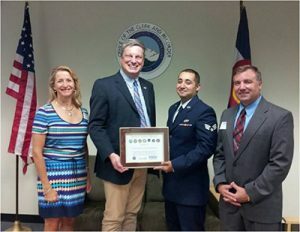 In recognition of the Clerk and Recorder’s Office’s commitment and support of the men and women serving the United States in the National Guard and Reserve. The Clerk’s Office is diligent in recognizing the unique circumstances of those serving in every branch of the armed forces. We support the military in our processes including motor vehicle registration and voting to ensure they are unencumbered in transacting their business. 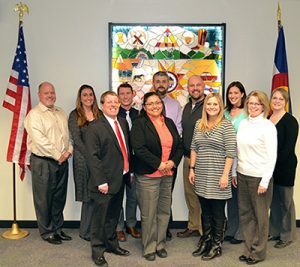 In recognition of the Election Department staff’s dedication and service to voters during the Waldo Canyon Fire. On the day of the 2012 Primary Election, the fire jumped Queens Canyon and burned homes close to the Citizens Service Center where the Elections Department was counting ballots. The Election staff was ordered to evacuate the building, after the polls closed, with partial results posted. The election process continued at a different location in the following days.